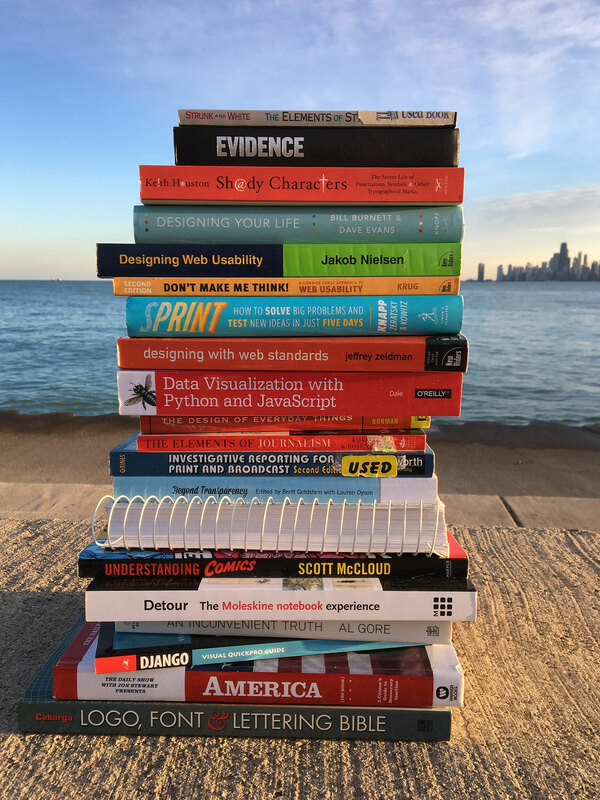 Some of my books on the shore of Lake Michigan. Photograph by Richard Cornish. How do you work with PMs, engineers, and designers? Which project was most interesting to you? How did you handle a project that was difficult? Whom in the industry do you follow? Which products do you enjoy using? User experience design is the creation of the total range of interactions a person can have with a product or service. Disciplines such as user research, content strategy, interaction design, and usability testing can all inform designing the experience of a user; the International Organization for Standardization defines the term formally. Most projects should start by studying potential or existing customers with the goal of discovering their desired outcomes based on current situations, motivations, and obstacles. Studies can be conducted in the field or remotely and are composed of observations and interviews. Supplemental are marketing demographics, surveys, competitive analysis, customer support, and social media. Based on the results of research, team members generate personæ or Jobs-to-be-Done. Designers explore possible solutions in the form of prototypes that are based on sketches, flowcharts, wireframes, and visual mockups. Prototyping tools include Sketch, InVision, and Keynote. “If a picture is worth a thousand words, a prototype is worth a thousand meetings,” a wise man once said. Quantitative methods of evaluation include fixing your analytics, recording usability tests, generating heatmaps, and analyzing A/B tests for statistical significance. Qualitative methods include interviews or surveys composed of open-ended questions to discover comprehension and motivation. Before embracing a design process, team members should agree on the level of maturity that design will have. “A Rough Design Maturity Continuum” by Jess McMullin is a good place to start for creating a shared vocabulary. Design thinking by IDEO, the design sprint by Google Ventures, and Draft Method by Draft are all great methods to study and consider. In the morning, I am more likely to check e-mail and Slack for project updates, check in with team members, and read industry news. In the afternoons, I am more likely to keep my head down for the work at hand. In general, I like working alone when I know how to do the task well, and I like working with others when they complement my skillset. If you’re asking if brainstorming works, Jake Knapp has a pretty good answer. If you’re asking if collaboration works, Leigh Thompson has a pretty good answer. How do you work with managers, engineers, and designers? Product managers keep projects on time, on budget, and within scope, which makes timely communication with signal essential. Presenting deliverables in a “big reveal” to product managers without adequate testing and analysis is design theater and invites risk by speculation. Engineers live in a world of feasibility. They appreciate understanding the range of scenarios and their edge cases, either by annotated wireframes or interactive prototypes. I won’t say that designers should code, but I will say that designers should communicate—and code is one way to do it. Come to designers with problems—by asking “How might we…?”—rather than with a pre-conceived solution. Learn the science of the field. Point to functional examples of design in the real world. Emphasize the results generated by deliverables rather than the deliverables themselves. Know the difference between style and design. I created a website to accompany a summer computer programming course I taught to gifted middle-school students. The website’s original purpose was to act merely as a meta example to point to in lecture: a website about a class making websites. But after the course began, I started seeing the results of in-class exercises and homework. The results influenced not just the syllabus but the execution of the syllabus itself. I started updating the website with daily lecture material, homework assignments, and their respective answer keys. I wasn’t conducting a formal field study, but I was watching and talking to my students, which helped me improve the website in ways I couldn’t imagine alone. Had I more time, other website features might have included scheduling parent-teacher conferences, uploading homework assignments, administering quizzes, announcing grades, and taking attendance. I agreed once to help a client who said he needed a clean, professional redesign of his website. I worked with him and his team of developers who wrote the front-end code and application logic. We held many meetings, and I worked hard on many different designs that were vetted internally. After launching the redesign, the only metric that increased were the customer support tickets. User growth and usage continued to stall. We held meetings to identify possible confusion and unsightliness in the designs. During a discussion of whether three or four bullet points would optimize conversion on the homepage did it occur to me: Best practices lacked the sophistication to inform us of a more specific strategy, creating a vaccum for speculation. Only by gathering data from these specific users using these specific designs would we progress. This story reminds me that it’s not enough to know best practices. If what we make is new or different, then we need to vet those things with the outside world before production. David Kelley is the founder of design firm IDEO and creator of the Hasso Plattner Institute of Design at Stanford University, known as the “d.school.” He helped Apple to design the first usable mouse. Don Norman is the director of The Design Lab at the University of California, San Diego, author of The Design of Everyday Things and “Human-Centered Design Considered Harmful”, and, while at Apple, the first person to hold the title of user experience architect. Mikey Dickerson is the technologist who helped fix HealthCare.gov, which led to the creation of Ad Hoc, 18F, and the U.S. Digital Service. Jake Knapp is a former design partner at Google Ventures and author of Sprint, which defines Google’s design sprint methodology. 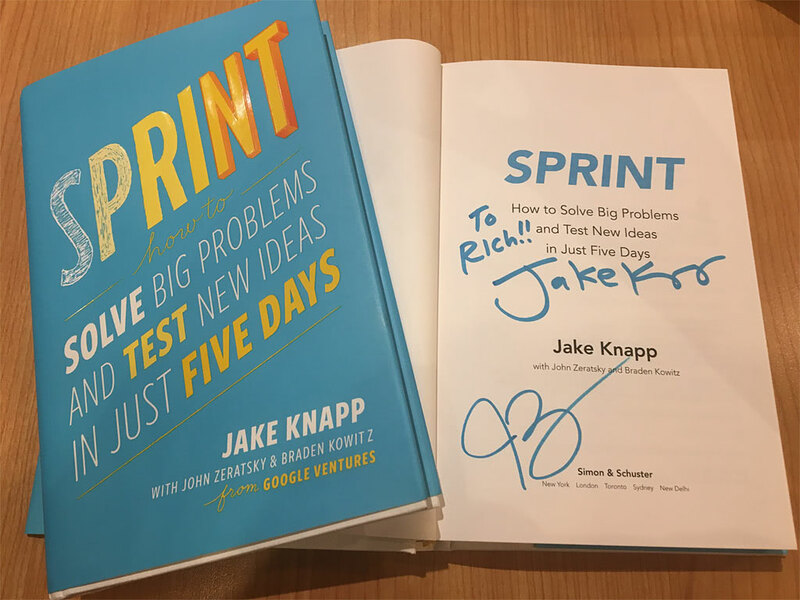 Jake signed my copy of Sprint. Jake is swell. Alan Weiss is a consultant and author of Million Dollar Consulting, which argues that price should reflect the value a service generates, rather than the time it took to complete. I follow these folks on Dribbble. I follow these folks on GitHub. Other swell design people include: Tim Brown, Jared Spool, Jakob Nielsen, Steve Blank, Wilson Miner, Daniel Burka, Charlie Deets, Naz Hamid, Leah Buley, Leisa Reichelt, Luke Wroblewski, Tim Van Damme, Marc Edwards, Robert Andersen, Daniel Eden, David Merfield, Scott Thomas, Nick Disabato, Lee Munroe, Nick Kolenda, Shay Howe, and Matt Williams. Weather Line displays hourly, daily, and monthly weather forecasts in clear, simple infographics, and integrates storm tracking by the minute via Dark Sky, marrying the best of data with the best of design. Sleep Cycle is an intelligent alarm clock that analyzes your sleep patterns and wakes you in the lightest sleep phase. Rarely will you get jolted again by the blare of an alarm clock. 1Password is a beautiful and easy-to-use password manager. It is proof that compromise between convenience and security isn’t necessary. The macOS app, Chrome extension, and the cloud syncing made it much better than the passwords.txt file on my desktop. You should work with me because you have an expensive business problem that cannot be solved by a traditional graphic or web designer. Instead of limiting design to its subjective appearance, I adopt a results-centered approach by focusing on the bottom line—whether that’s in dollars made or in customer satisfaction.